Since Pedersen first reported the synthesis of crown ethers and their cation-complexing properties in 1967, the development of new class of macrocyclic hosts has always been one of the most important topics in host-guest chemistry, and also supramolecular chemistry during the last half century. Consequently, various macrocyclic hosts [1, 2, 3, 4] including crown ethers, cryptands, cyclodextrins, cavitands, cyclophanes, cucurbiturils, calixpyrroles, cyclopeptides, and others have been reported, and these hosts have undoubtedly played a very important role in the emergence and development process of both host-guest chemistry and supramolecular chemistry. 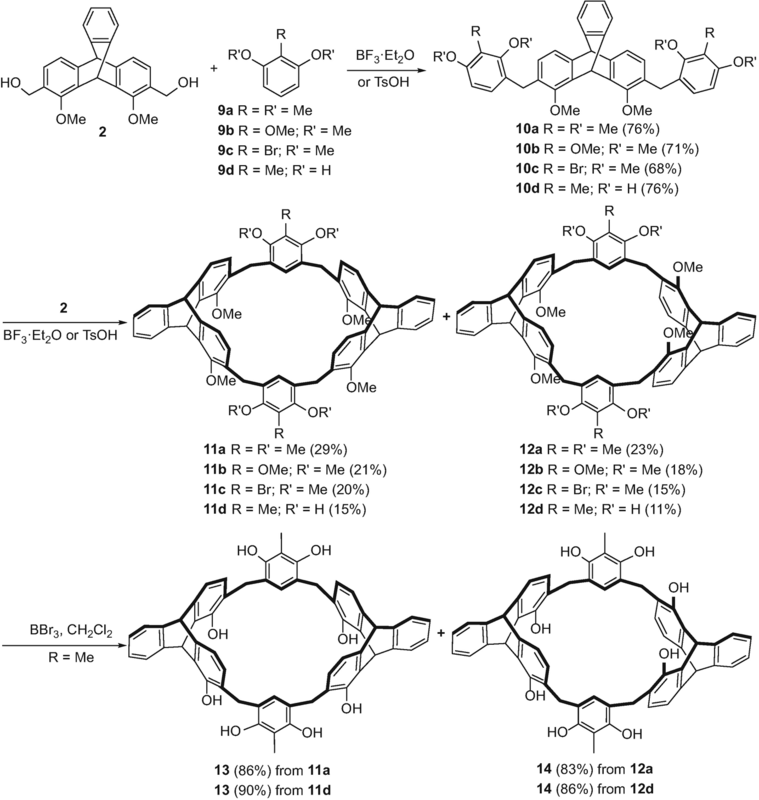 In the known synthetic macrocycles, calixarenes have become one of most important macrocyclic hosts and thus found wide applications on supramolecular chemistry. Since calixarenes were first efficiently synthesized and named by Gutsche and coworkers in the late 1970s, they and their analogues including resorcinarenes, cyclotriveratrylenes, pillararenes, and others have attracted much attention during the last decades. So calixarenes were also called as “the third generation of host molecules” after crown ethers and cyclodextrins. Since calixarenes and their analogues are all composed of substituted aromatic rings bridged by methylene or methenyl groups, we can also call them as a type of macrocyclic arenes. 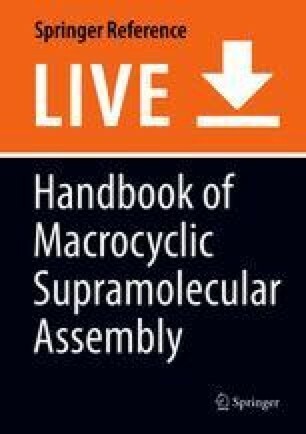 Actually, the known macrocyclic hosts are all composed of building blocks with specific structures and reactivity. Undoubtedly, exploration of new building block is important for design and synthesis of novel macrocyclic hosts with specific structure and properties. 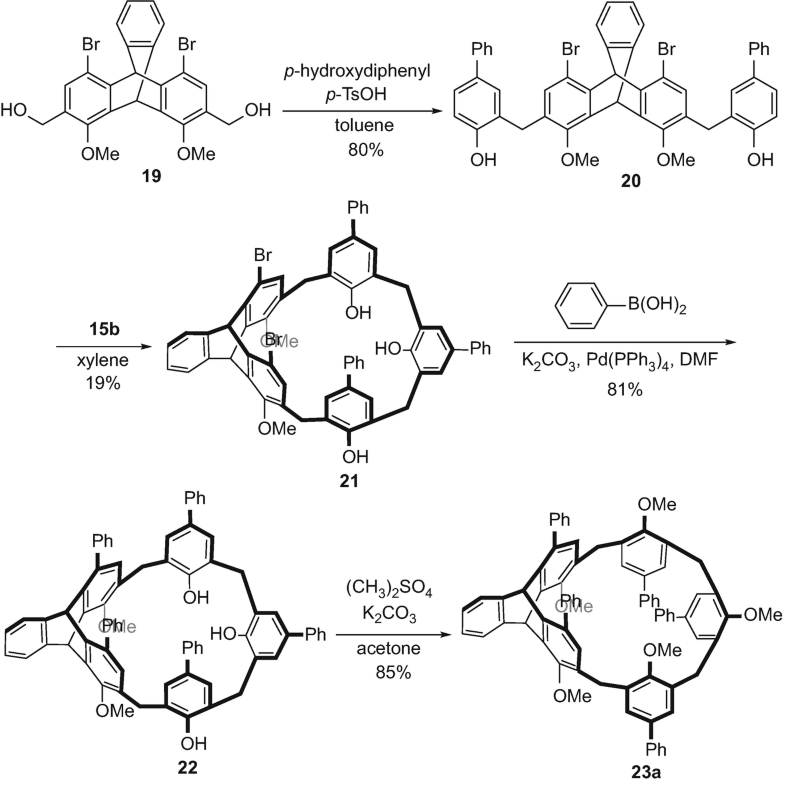 Iptycenes [5, 6] are a class of aromatic compounds with arene units fused to bicyclo[2.2.2]octatriene bridgehead system. Triptycene, the first and simplest member of this family, has D3h symmetry with a unique Y-shaped rigid structure, in which the three phenyl ring “panels” are connected with the bridgehead carbons (Fig. 1). Because its structure was like the triptych of antiquity, a book with three leaves hinged on a common axis, it was thus named as triptycene. In 1942, Bartlett and his coworkers first reported the synthesis of triptycene by multi-step reactions. Wittig et al. then synthesized the triptycene in one-pot step by addition of benzyne to anthracene in 1956. Stiles et al. further obviously improved the yield of triptycene by the use of a new synthesis of benzyne, which subsequently provided a convenient and efficient method for the synthesis of triptycene. However, triptycene chemistry almost focused on the synthesis of triptycene and its derivatives at the early days of the development. 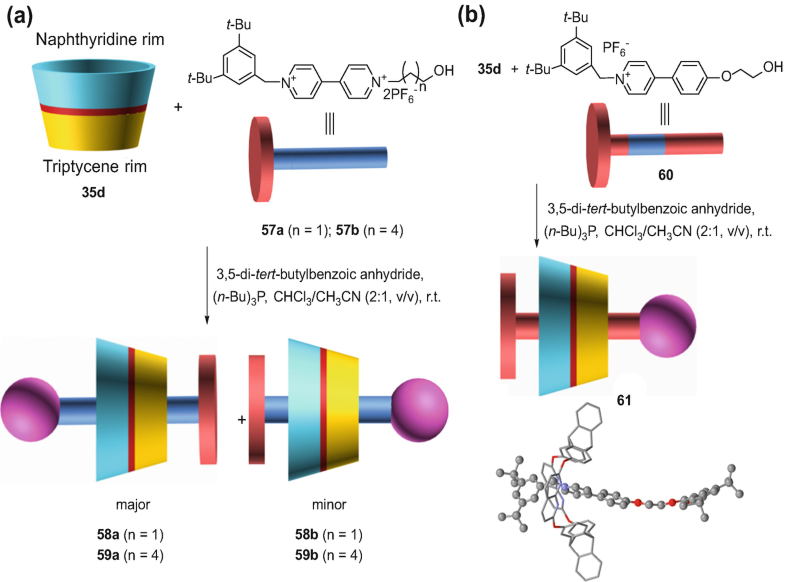 Only after the 1980s of the last century, especially in recent years, triptycene with three-dimensional rigid structure and rich reactive positions has drawn much attention and found more and more applications in molecular machines, supramolecular chemistry, and other research areas. Previously, we [5, 7] have developed a new kind of synthetic hosts by the combination of triptycene building block with unique Y-shaped rigid structure and crown ether chains, including triptycene-derived cylindrical macrotricyclic polyethers [8, 9, 10, 11] and tweezer-like triptycene-derived crown ethers [12, 13, 14]. The rigid triptycene moiety favors these hosts to generate multi-cavity structures, while the flexible crown ether moiety facilitates the hosts to adjust their conformation for the encapsulated guests. These specific structural features make the hosts show the diversified complexations with different kinds of guests, especially, multiple stimuli responsive complexation, which will be useful for the design and construction of functionalized supramolecular assemblies. Recently, we also applied the tritopic triptycene-derived tri(crown ethers) into the design and construction of molecular switches and machines [15, 16]. Triptycene derivatives 1a–1d with two hydroxyl groups or amino groups (Fig. 2) are easily available compounds . 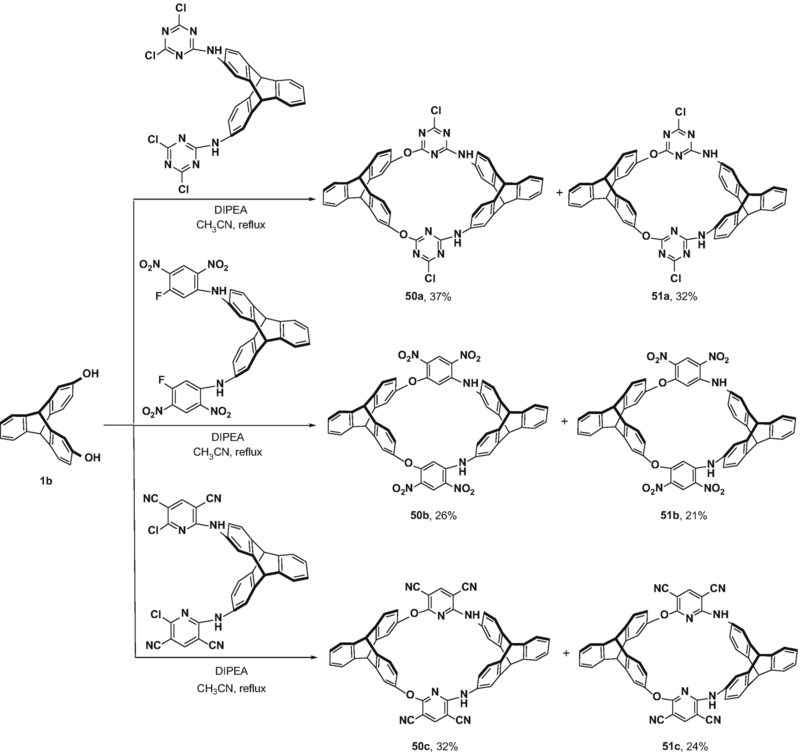 Based on 1,8-dihydroxyltriptycene 1a as the building block, a new kind of triptycene-derived calixarenes could be obtained, while 1b and 1c could be used into the design and synthesis of the calixarene analogues, heteracalixarenes, and also tetralactam macrocycles. Especially, with the chiral triptycene building block 1d, a new kind of chiral macrocyclic arenes composed of subunit 1d bridged by methylene groups could be achieved. In this chapter, we will summarize our recent research results in synthesis, structures, applications in host-guest chemistry, and molecular assembly of the triptycene-derived macrocyclic arenes including calixarenes, heteracalixarenes and analogues, and helicarenes, a new kind of chiral macrocyclic arenes recently developed by our group. Replacement of the phenol groups in a classic calixarene with one or more 1,8-dihydroxyltriptycene 1a moieties, new kinds of calixarenes with large cavities and fixed conformations can be obtained. 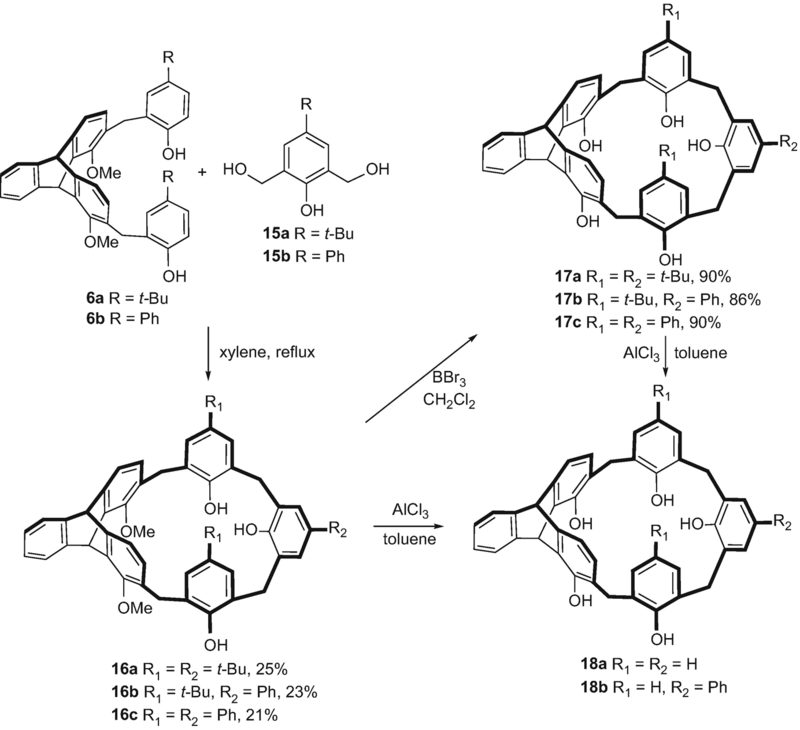 So we [18, 19] first made use of triptycene moiety 1a with the 3D rigid structure in place of the phenol groups in the calixarene to obtain a pair of diastereomeric triptycene-derived calixarenes or calixtriptycenearenes 4a and 5a were synthesized in 19 and 17% yields, respectively (Scheme 1, route a), by one-pot reaction of triptycene derivative 2 with one equivalent of 3a in a catalytic amount of p-toluenesulfonic acid . Under the same reaction conditions, the one-pot reaction of 6 with triptycene derivative 2 gave triptycene-derived calixarenes 4b and 5b in 17 and 11% yields, respectively. Although triptycene-derived macrocyclic hosts 4 and 5 could be conveniently obtained by one-pot approach, the relatively low yields limited their practical preparation of the desired macrocycles. Thus, we also obtained 4a (25%), 4b (20%), 5a (19%), and 5b (17%) by the fragment-coupling approach . As shown in Scheme 1, by the reaction of compound 2 with an excess of p-substituted phenol in refluxing toluene in the presence of p-toluenesulfonic acid, the [1 + 2] products 6a and 6b with yields of 89 and 83%, respectively, were obtained. Then, 6 further reacted with 2 in o-dichlorobenzene in the presence of p-toluenesulfonic acid to give the targets 4 and 5. By the treatment of macrocycles 4 and 5 with BBr3 in dry CH2Cl2, the corresponding demethylated 7 and 8 (Fig. 3) were obtained in 71 and 78% yields. When 7a and 8a were treated with AlCl3 in toluene at room temperature, the de-tert-butylated 7c and 8c were obtained in 61 and 54% yields, respectively. Moreover, by treatment of 4a and 5a with AlCl3 in toluene, we also directly got 7c and 8c, respectively, in moderate yields . Treatment of 2 with excess of 2-methyl-1,3-dimethoxybenzene 9a in CH2Cl2 with BF3·Et2O as the catalyst gave 10a in 76% yield, which was then reacted with 2 in the presence of BF3·Et2O to afford 11a and 12a in 29 and 23% yields, respectively. 11a and 12a were demethylated by BBr3 in CH2Cl2 to give 13 and 14 in 86 and 83% yield, respectively. Similarly, 11b–d and 12b–d were also obtained. Further demethylation of 11d and 12d by BBr3 in CH2Cl2 gave 13 and 14 in 90 and 86% yield, respectively (Scheme 2) . According to the similar synthetic approach as that of calixarenes, a series of novel calixarenes 16a–c containing one 1,8-dimethoxytriptycene moiety could also be obtained by the heat-induced fragment-coupling reactions. 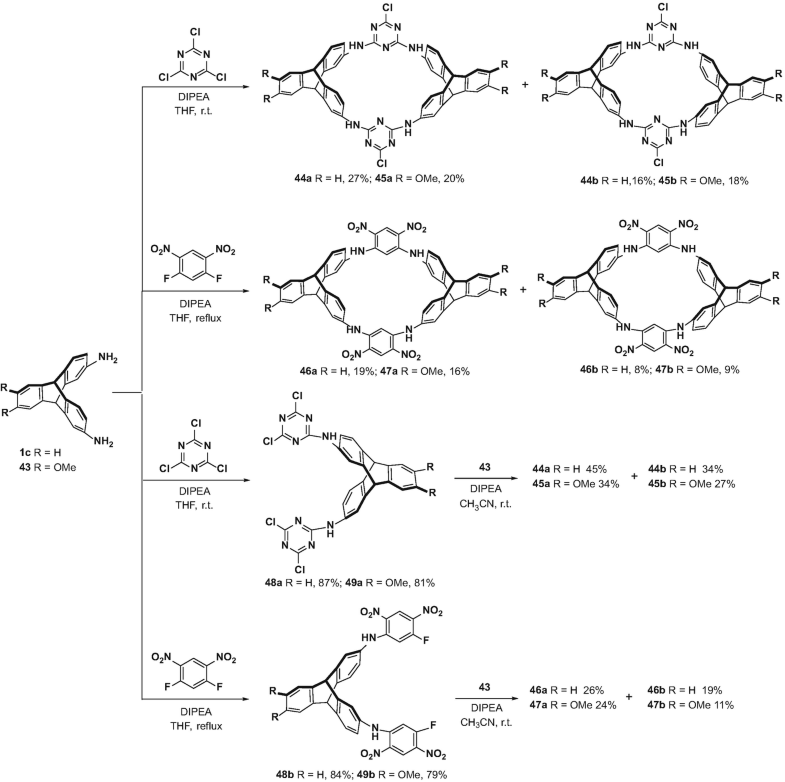 When 6a or 6b reacted with 2,6-dihydroxymethylphenols 15a–b in refluxed xylene for 2 days, triptycene-derived calixarenes or calixtriptycenearenes 16a–c were obtained in 25, 21, and 23% yield, respectively (Scheme 3). Treatment of 16a–c with BBr3 gave the corresponding demethylated products 17a–c in 86–90% yields. De-tert-butylated products 18a and 18b were obtained by treatment of 17a and 17b with AlCl3 in 82 and 75% yields, respectively. Under the same conditions, 16a and 16b could be simultaneously de-tert-butylated and demethylated to give 18a and 18b in high yields . Dibromo-substituted calixarene 21 was obtained from 19 by the similar synthetic strategy as above (Scheme 4) . Then calixarene 22 with a deeper cavity could be easily synthesized by Suzuki coupling reaction of 21 with phenylboronic acid. Treatment of 22 with dimethyl sulfate in the presence of potassium carbonate gave full methyl etherified calixarene 23a in 85% yield. Due to the lack of the intramolecular hydrogen bonds, 23a adopted a 1,2-alternate conformation, which is different from 22 with cone conformation. By treatment of 16a with excess bromine in CH2Cl2, it was interestingly found pentabromo-substituted calixarene 24 in cone conformation was obtained in 92% yield (Scheme 5). Treatment of 24 with dimethyl sulfate in the presence of potassium carbonate gave 25 in 72% yield, which also adopted 1,2-alternate conformation. Furthermore, by Suzuki coupling reactions of 25 with arylboronic acids in the presence of Pd(PPh3)4 and anhydrous potassium carbonate, calixarene derivatives 23a–b with deep cavities were obtained in good yields . Calixresorcinarenes or resorcinarenes are a class of well-defined macrocyclic compounds related to calixarenes. We  recently synthesized a series of calixresorcinarene-like hosts containing two triptycene moieties and two p-substituted phenol moieties. As shown in Scheme 6, starting from 2,7-dimethoxyltriptycene 27, we first prepared precursor 29 in two steps, which then reacted with p-substituted-phenols in the presence of p-toluenesulfonic acid to give 30a–c. Treatment of 30a–c with equimolar amount of 29 in o-dichlorobenzene in the presence of p-toluenesulfonic acid produced calixresorcinarenes 31a–c. Similarly, the corresponding demethylated macrocycles 32a–c could be obtained in high yields by BBr3 in CH2Cl2. 2,7-Dihydroxyltriptycene 1b could also be utilized as the nucleophilic reagent for the design and synthesis of oxacalixarenes by the nucleophilic aromatic substitution reactions. As shown in Scheme 7, by one-pot reaction of 2,7-dihydroxytriptycene 1b and electrophilic reagents 34a–c in DMSO with Cs2CO3 or K2CO3 as the base, oxacalixarenes 35a–c and 36a–c with extended cavities could be conveniently synthesized . When compound 1b reacted with 2,3,5,6-tetrachloropyridine 34a in DMSO in the presence of Cs2CO3, the extended oxacalixarenes 35a and 36a could be obtained in 19% and 25% yield, respectively. By the similar nucleophilic aromatic substitution reactions of 1b with 1,5-difluoro-2,4-dinitrobenzene 34b in the presence of K2CO3, the macrocycles 35b and 36b could be obtained in 22 and 15% yield, respectively. 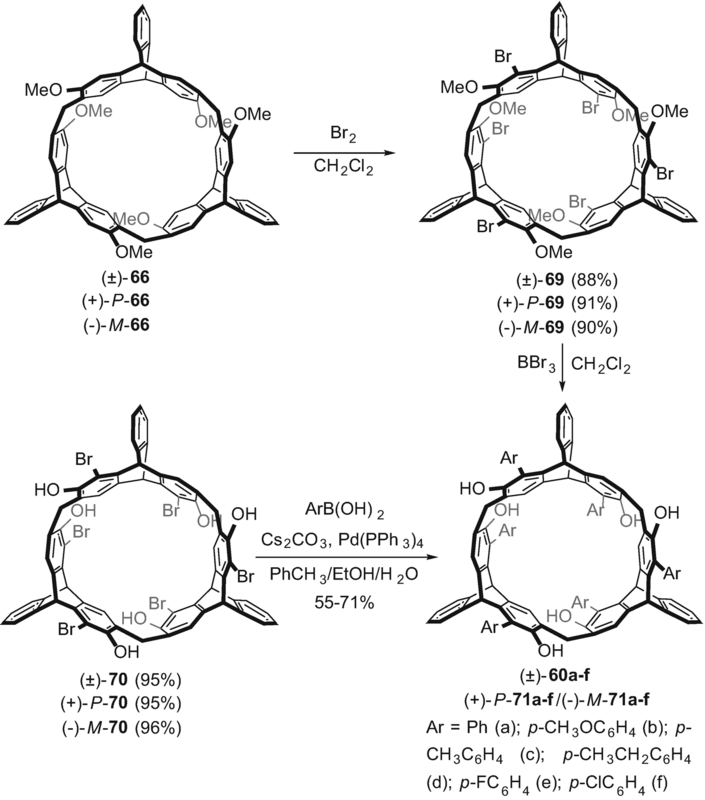 However, the extended oxacalixarenes 35c and 36c could not be synthesized under the same coupling conditions as above due to the instabilities of target macrocycles. Under various conditions examined, we found that the target oxacalixarenes 35c and 36c could be obtained by the SN2 reaction of 1b with cyanuric chloride 34c in acetone instead of DMSO in the presence of K2CO3. Moreover, 35c and 36c could be synthesized by the reaction of 1b with cyanuric chloride 34c in acetone with K2CO3 as the base, and they could also be obtained by the two-step fragment-coupling approach. Thus, the reaction of 1b and cyanuric chloride 34c in tetrahydrofuran in the presence of diisopropylethylamine (DIPEA) afforded the [1 + 2] product 37 in 58% yield. Then, the further coupling reaction of compound 37 with 1b in acetone with DIPEA as base at room temperature gave the extended oxacalixarenes 35c and 36c in 12 and 15% yield, respectively. Similarly, oxacalixarene 35d containing two triptycene subunits and two naphthyridine subunits was conveniently synthesized in 37% yield by one-pot reaction of 33 and 34d in refluxed 1,4-dioxane in the presence of Cs2CO3 . When the reaction of 33 and 34d was carried out in DMSO at 105 °C with Cs2CO3 as the base, 35d and 36d were isolated in 17 and 9% yield, respectively . By two-step fragment-coupling approach, 38a was synthesized in good yield with paraquat as a template. Reaction of 38a with aniline in acetone in the presence of K2CO3 gave 38b in 78% yield (Scheme 8c) . Compared with oxacalixarenes, homooxacalixarenes are a class of heterocalixarene analogues with the heteroatoms partly or completely replaced by CH2OCH2 groups, which could have bigger cavities and show different recognition properties. With the increased cavity sizes, homoheterocalixarenes can show different recognition properties and a wide field of applications. Recently, we  conveniently synthesized triptycene-derived homooxacalixarene analogues 39a–d and 40a–d in moderate yields by one-pot reactions of 2,7-dihydroxytriptycene 1b with 1,3-bisbromomethylbenzene derivatives in the presence of Cs2CO3 and further obtained two pairs of “basket-like” triptycene-derived homooxacalixarene analogues 41a–b and 42a–b (Fig. 4). We  also designed and synthesized several pairs of novel triptycene-derived N(H)-bridged azacalixarenes 44–47 by two synthetic routes with 2,7-diaminotriptycene 1c and its analogue 43 containing an o-dimethoxybenzene subunit as materials. 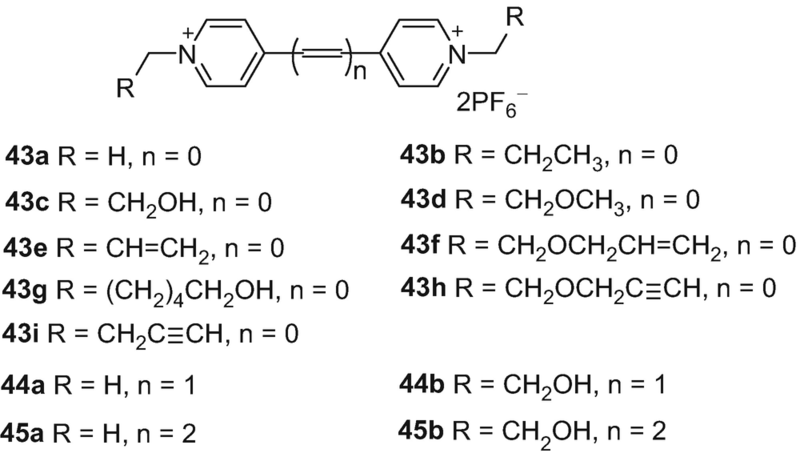 As shown in Scheme 9, the one-pot reaction of 2,7-diaminotriptycenes 1c or 43 with 1,5-difluoro-2,4-dinitrobenzene 34b in dry THF in the presence of DIPEA gave triptycene-derived N(H)-bridged azacalixarenes 44–45 in the yields of 16–27%. By the same reaction conditions, triptycene-derived N(H)-bridged azacalixarenes 46–47 were obtained by the reaction of 1c or 43 with cyanuric chloride 34c in the yields of 8–19%. These target macrocycles 44–47 could also be synthesized in higher total yields by a two-step fragment-coupling method. With 1c or 43 as materials, the [1 + 2] products 48a–b and 49a–b were first synthesized in high yields by the reaction of 2,7-diaminotriptycene with the corresponding electrophilic reagents. Then, the [1 + 2] products further reacted with 2,7-diaminotriptycenes 1c or 43 in CH3CN in the presence of DIPEA to afford the macrocycles 44–47. As shown in Scheme 10, we  synthesized a series of triptycene-derived diazadioxacalixarenes 50a–c and 51a–c by a two-step SNAr reaction of 2,7-dihydroxytriptycene 1b or 2,7-diaminotriptycene 1c with proper electrophilic reagents, such as cyanuric chloride, 1,5-difluoro-2,4-dinitrobenzene, and 2,6-dichloropyridine-3,5-dicarbonitrile. When 2,7-dihydroxytriptycene 1b was reacted with the electrophilic reagents in THF in the presence of DIPEA, the corresponding [1 + 2] products could be obtained in high yields. The further macrocyclization reaction between the [1 + 2] products and the corresponding electrophilic reagents gave the target triptycene-derived diazadioxacalixarenes 50a–c and 51a–c in moderate yields. Due to their capability of binding substrate species strongly and selectively, tetralactam macrocycles have been widely applied to construct a variety of interlocked supramolecular assemblies, develop new molecular machines, and improve the properties of organic dyes by molecular encapsulation. In 2008, we  designed and synthesized a pair of novel triptycene-derived tetralactam macrocycles 52a–b. As shown in Scheme 11, by a one-pot [2 + 2] cyclization reaction of pyridine-2,6-dicarbonyl dichloride and 2,7-diaminotriptycene in dry THF in the presence of Et3N, macrocycles 52a–b could be conveniently synthesized in 20–26% yields. Due to the different linking modes of the triptycene moieties, 4a and 5a are a pair of diastereomers. 4a is a syn orientation of the two triptycene moieties, while 5a is an anti orientation isomer . Both of them showed one singlet for the tert-butyl protons, one singlet for the methoxy protons and two singlets for the bridgehead protons of the triptycene moiety in the 1H NMR spectra, while there was only one signal for the methylene carbons in their 13C NMR spectra. Moreover, there were no obvious changes in the methylene proton signals with increasing temperature in their variable-temperature 1H NMR spectra. These observations suggested that both 4a and 5a have highly symmetric structures and fixed conformations. However, their 1H NMR spectra showed a large difference from each other. For the methylene protons, a pair of doublet signals at 3.35 and 4.25 ppm (Δδ = 0.90) were observed in 4a, whereas 5a showed a pair of doublet signals at 3.67 and 3.86 ppm with a Δδ value of about 0.19 ppm. This result implied that macrocycles 4a and 5a are a pair of diastereomers, 4a has a syn orientation of the two triptycene moieties, while 5a is an anti orientation isomer. Similarly, 4b and 5b, 7a–c and 8a–c, 11a–d and 12a–d, 13, and 14 are also diastereomers with symmetric structures and fixed conformations, respectively, in which the formers were syn isomers, while the latter ones were trans isomers [19, 20]. For calixtriptycenearenes 16–18, they adopted fixed cone conformation in solution as well although they have bigger cavities than the classic calixarene . For 16a, variable-temperature 1H NMR experiments showed its coalescence temperature is more than 100 °C, which is much higher than those of the classic p-tert-butylcalixarene and p-tert-butylcalixarene. This indicated that the significant contributor in determining the conformational mobility of 16a is not due to the intramolecular hydrogen bonds and the bulky tert-butyl groups but mainly attributed to the introduction of the triptycene moiety with rigid structure. For triptycene-derived calixarenes 16b–c, they also showed the similar spectral features to those of 16a. The results showed that all of the triptycene-derived calixarenes 16a–c containing two dimethoxy groups had Cs symmetric structures with a fixed cone conformation in solution. Their demethylated compounds also have the similar 1H NMR spectra features and the same fixed cone conformations as those of their precursors. Moreover, the variable-temperature 1H NMR experiments of 16a–c in DMSO-d6 showed no obvious changes of the methylene proton signals with the increase of the temperatures even up to 373 K. These observations not only confirmed their fixed conformations but also indicated that the conformational inversion barriers of these compounds are very high. 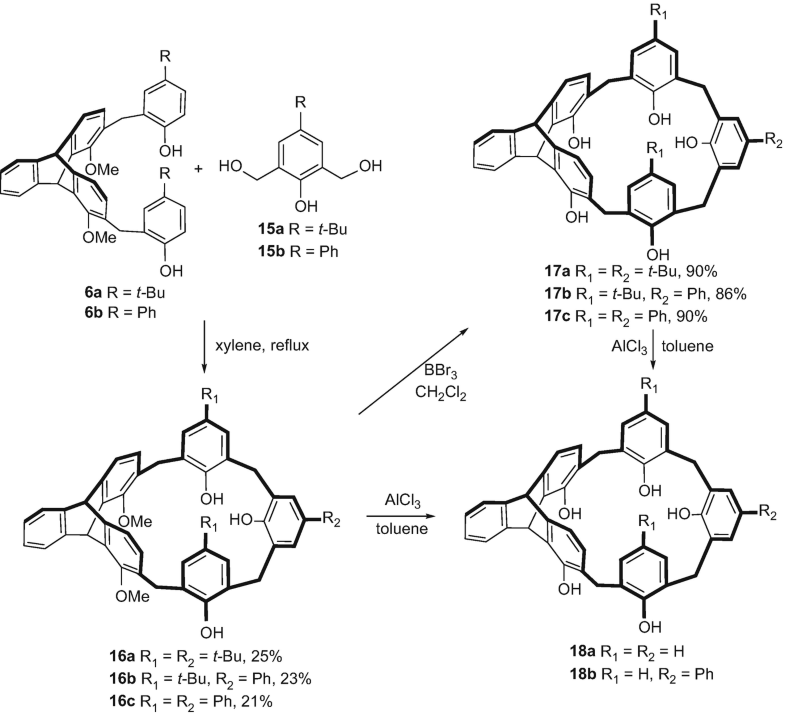 Similarly, 21, 22, and 24 with different substituents at the upper rim also kept fixed cone conformation in solution due to the rigid structure of triptycene and the intramolecular hydrogen bonding of the adjacent phenol groups. But after 22 and 24 were all methyl etherified, products 23 and 25 showed 1,2-alternate conformations in the tested temperatures . We also investigated the structures of triptycene-derived calixresorcinarene-like hosts 32–33  in solution by the 1H NMR, 13C NMR, and variable-temperature 1H NMR experiments. The spectra features showed that these calixresorcinarene-like hosts 32–33 are all the cis isomers with fixed cone conformation in solution. Similar to triptycene-derived calixarenes, triptycene-derived oxacalixarenes 35a–d and 36a–d are also a pair of diastereomers with high symmetric structures and fixed conformation in solution, in which 35a–d are cis isomers and 36a–d are trans isomers [24, 26]. For triptycene-derived homooxacalixarene analogues, the 1H NMR spectra of 39a–d  showed two singlets for the bridgehead protons with small Δδ value, which implied that they were cis isomer with a high symmetric structure. Meanwhile, the 1H NMR spectra of 40a–d showed the relatively significant different chemical shifts for bridgehead protons, which suggested that they were the trans isomers. It was noteworthy that the two sets of doublet signals of trans isomer 40c for the methylene group were gradually changed to one set of doublet signals above 370 K, which meant that at very high temperature, the rigid conformation of 40c was no longer existed. However, for cis isomer 39c, the methylene proton signals exhibited no obvious changes even up to 380 K. When the two p-phenyl-substituted benzene rings were linked together by crown ether chains, the conformations of macrocycles 41 and 42 could be fixation up to 380 K without free rotation. Triptycene-derived N(H)-bridged azacalixarenes 44a–47a and 44b–47b  are also pairs of diastereomers. It was found that the 1H NMR spectra of cis isomers 44a–47a showed the close chemical shifts of the aromatic protons and small different shifts for the benzylic protons with the high symmetry boat conformation, while the trans isomers 44b–46b showed four singlets with significant different chemical shifts for bridgehead protons and two singlets for the protons of N−H bridged groups. These observations suggested that trans isomers 44b–46b do not adopt the chair conformation but fixed curved-boat conformation without the high symmetry at room temperature, which are different from those of the triptycene-derived oxacalixarenes with trans isomers . However, the 1H NMR and 13C NMR spectra of trans isomer 47b showed its high symmetrical structure with a chair conformation in solution. 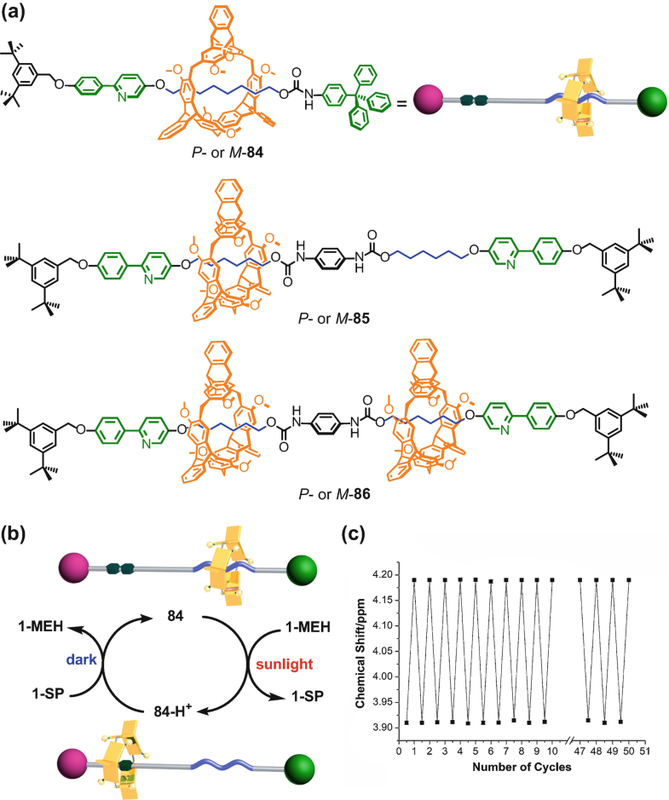 We deduced that the different properties of dynamic conformational interconversion probably resulted in the different conformations between 47b and 44b–46b [24, 29]. Similarly, triptycene-derived diazadioxacalixarenes 50 and 51a–c are also pairs of diastereomers due to the 3D structural characteristic of triptycene unit . By the 1H NMR spectroscopy, their spectra exhibit that the cis isomers 50a–c adopt twisted boat conformation, while the trans isomers 51a–c are in a symmetrical chair conformation. For triptycene-derived tetralactam macrocycles 52a and 52b , they are a pair of diastereomers because their 1H NMR spectra are greatly different from each other. Both of cis isomer 52a and trans isomer 52b have highly symmetrical structures, and they exhibit only one signal for the N-H protons and two single signals for the bridgehead protons of the triptycene moieties in their 1H NNR spectra. As shown in Fig. 5, the crystal structures showed calixtriptycenearene 4a is a cis isomer with boat conformation, while 5a is a trans isomer with chair conformation . It was found that all of the macrocyclic compounds have highly symmetrical structures and specific fixed conformations in the solid state, which are consistent with the results in solution. For 7a, a typical cone conformation with high symmetric feature of C2v was shown. Due to the intramolecular hydrogen bonding in 7a, its dihedral angle between the two face-to-face p-tert-butylphenol rings is reduced to 7.44° compared with 138.23° of its precursor 4a. Moreover, the cavity cross section of 7a ranged from 9.56 × 12.09 Å (upper rim) to 7.91 × 8.84 Å (low rim) . Macrocycle 7c showed similar structural features to those of 7a, and the dihedral angle between the face-to-face phenolic rings is only 6.95°. For 13d containing two 2-methylresorcin subunits, similar structural feature to that of 7a was observed . For triptycene-derived calixarene 16a and its demethylated macrocycle 17a, the crystal structures showed they adopted cone conformations (Fig. 5e, f), in which intramolecular hydrogen bonding between the adjacent phenol hydroxyl groups or between the ether oxygen atoms and their adjacent phenol hydroxyl protons might play an important role in formation of the fixed conformations . 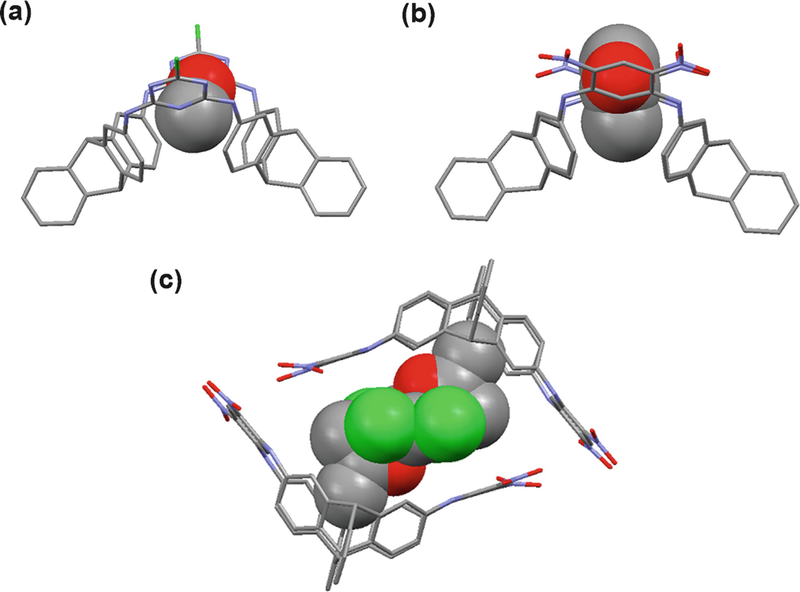 We also inferred that these intramolecular hydrogen bonding interactions might play an important role in the formation of their fixed cone conformations. Pentabromo-substituted calixarene 24 also kept cone conformations, but 25 with the phenol hydroxyl groups all substituted by methoxy groups showed 1,2-alternate conformation due to the lack of intramolecular hydrogen bonding (Fig. 5h) . Macrocycles 31a and 32a are all cis isomers with cone conformation (Fig. 6a, b), which are consistent with the results in solution . There existed one pair of intramolecular hydrogen bonding in 31a with the distance of 1.99 Å and two pairs of intramolecular hydrogen bonding with the distances of 1.91–1.99 Å for 32a. As a result, 32a shows a more symmetrical structure than 31a, and the dihedral angle of 9.47° between the face-to-face benzene rings of the triptycene moieties in 32a is much smaller than that of 31a (30.06°). For oxacalixarenes 35a and 36a, cis isomer 35a has 1,3-alternate conformation with a boat-like structure, while trans isomer 36a shows chair-like conformation . The crystal structure of cis isomer 35d showed that it had 1,3-alternate conformation with a cavity of 13.29 × 10.99 Å2 (wider rim) and 8.56 × 8.84 Å2 (narrower rim), in which the nitrogen atoms in the 1,8-naphthyridine are all positioned inside the cavity (Fig. 6d) . For trans isomer 36d, it adopted a curved-boat-like conformation in the solid state, which was different from the conformation in solution possibly due to the solvent effect. The X-ray crystal structures confirmed that triptycene-derived N(H)-bridged azacalixarenes 44a, 46a, and 48a were all cis isomers, while 44b was trans isomer . In the solid state, 44a showed a high symmetry with a C2 axis, while 46a and 48a had the similar boat conformations with a little different cavity from that of 44a. These observations indicated that either alternating another aromatic subunits or derivatization on the triptycene moiety, these macrocycles can keep the boat conformations. 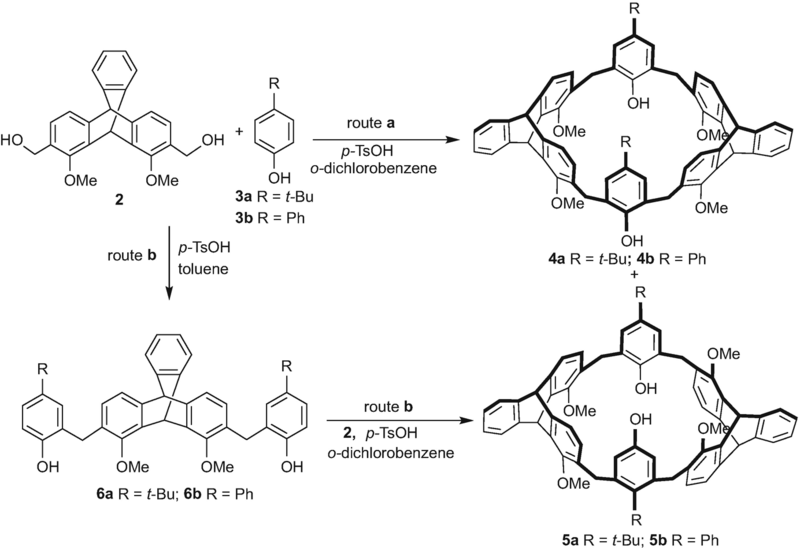 This unique structure makes triptycene-derived N(H)-bridged azacalixarenes to have the wider rim with the heteroaromatics point to the same direction, which is different from that of reported azacalixarenes. 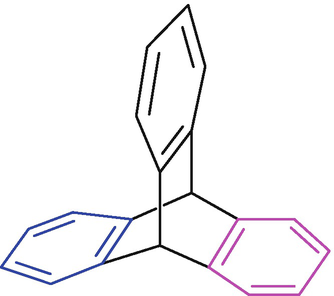 Compound 44b adopted a curved-boat conformation without a high symmetrical structure for the change of the position of one triptycene subunit (Fig. 7), which was different to the normal chair-like conformation of the previously trans isomer of triptycene-based oxacalixarene . For the triptycene-derived diazadioxacalixarenes, the crystal structure of cis isomer 50c  showed a high symmetry with boat conformation, in which the two pyridine rings showed the different positions for the different hybrid orbitals and electronic effects of nitrogen atom and oxygen atom. For triptycene-derived tetralactam macrocycles 52a and 52b, the X-ray crystal structures showed that they are a pair of diastereomers as well . Similar to corresponding classical calixarene, 52a is a cis isomer and adopts a cone conformation, four carbonyl groups attach to the wider rim, and the four amide N-H protons define the narrower rim, while the trans isomer 52b adopts a chair conformation, in which the two triptycene moieties are trans-connected by the pyridyl amide subunits. Moreover, the pairs of intramolecular hydrogen bonds were observed in both 52a and 52b, which played an important role in the formation of their specific conformation (Fig. 8). 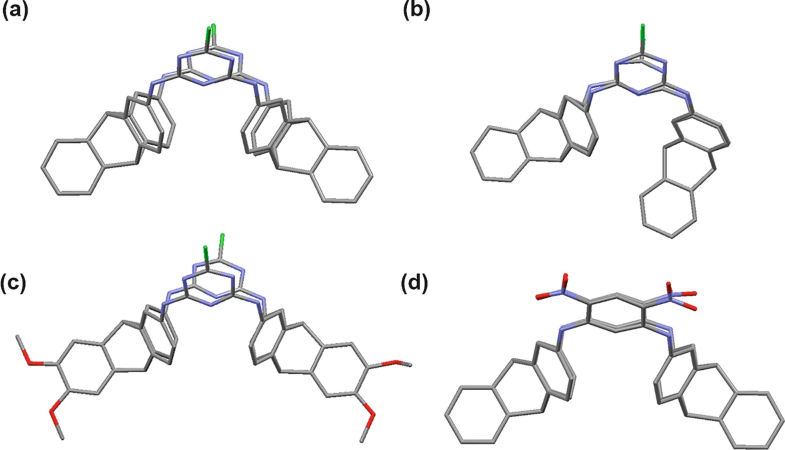 With large enough cavities and specific fixed conformations, triptycene-derived calixarenes and analogues could easily encapsulate small organic molecules in solid states. For example, triptycene-derived calixarene 4a could encapsulate two CH3OH molecules in its cavity. A pair of O−H···O hydrogen bonds between the phenolic oxygen atom and the hydroxyl proton of CH3OH were observed in complex 4a@2CH3OH. The cis isomer 2a could also accommodate two CH3OH molecules in its cavity via multiple non-covalent interactions, including O−H···O hydrogen bonds, C−H···O hydrogen bonds, and C−H···π interactions. In the case of the trans isomer 5b, it could encapsulate a CH2Cl2 molecule by multiple non-covalent interactions including C−H···Cl and C−H···O hydrogen bonding and C−H···π interaction between 5b and CH2Cl2. 7c contains one water molecule inside its cavity (Fig. 9a, b) . For calixtriptycenearenes, small neutral guest molecules are easily encapsulated in their fixed cone cavities as well (Fig. 9c) . Moreover, calixresorcinarene-like host 32a preferred to form a head-to-head dimeric capsule via two pairs of C−H···O hydrogen bonding interactions between the methyl protons of one triptycene moiety and the methoxyl groups of its adjacent macrocycle, while two CH2Cl2 molecules were located in this capsule by C−H···Cl interaction between the methyl proton of one macrocycle and each dichloromethane molecule (Fig. 9d) . The cis isomers of triptycene-derived N(H)-bridged azacalixarenes all adopt fixed boat conformations and have large enough cavities, which were similar to those of triptycene-derived calixarenes. They could show the capability of complexation with methanol and acetone molecules inside their cavities . For macrocycle 44a, there existed the O−H···N hydrogen bonding between the hydroxyl group of methanol and N atom in the triazine ring and the O−H···π hydrogen bonding between the hydroxyl group of methanol and one phenyl ring in triptycene moiety (Fig. 10a). Similarly, the cis isomer 46a could also encapsulate one acetone molecule in its cavity with multiple non-covalent interactions, including C−H···O hydrogen bonding and two pairs of C−H···π interactions (Fig. 10b). The similar molecular recognition property has not been observed in the reported N(H)-bridged azacalixarenes. 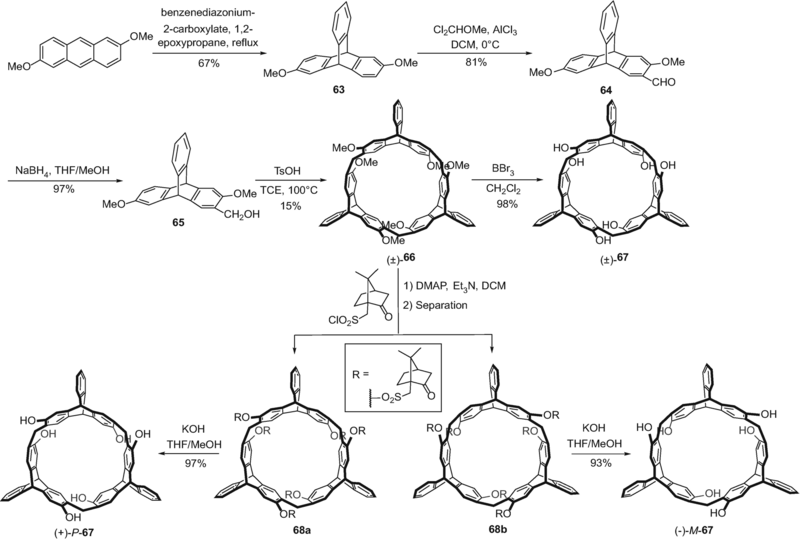 Moreover, it was found that two molecules of 46a can form a dimer through the Oδ−···Nδ+ and Oδ−···Cδ+ interactions with two acetone molecules and two dichloromethane molecules in its cavity (Fig. 10c). Fullerenes and their derivatives have drawn much attention for their wide potential applications. 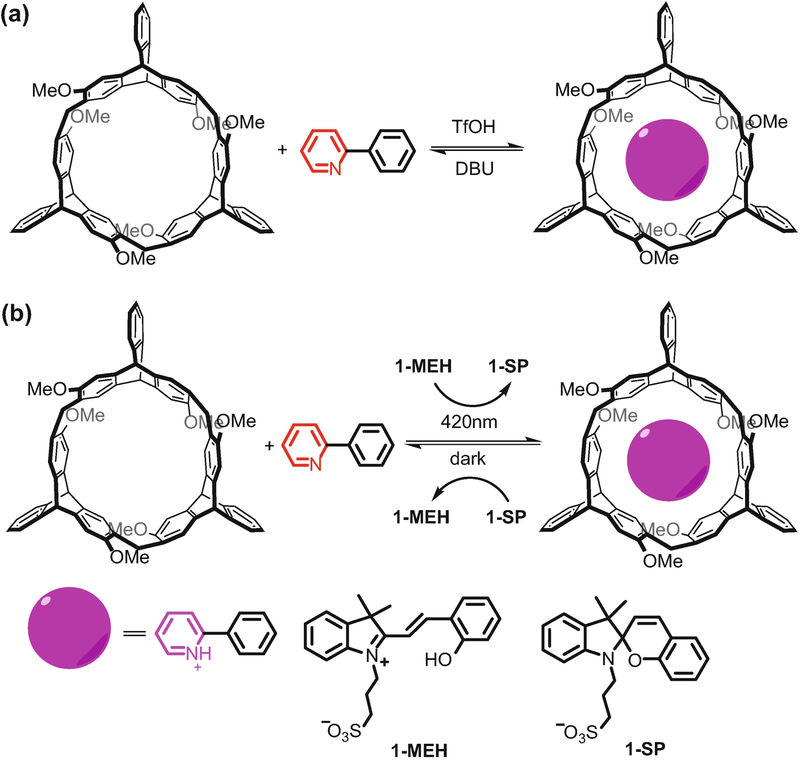 Design and synthesis of new classes of supramolecular containers for fullerenes are of great interest in relation to the development of fullerene-based functional materials. 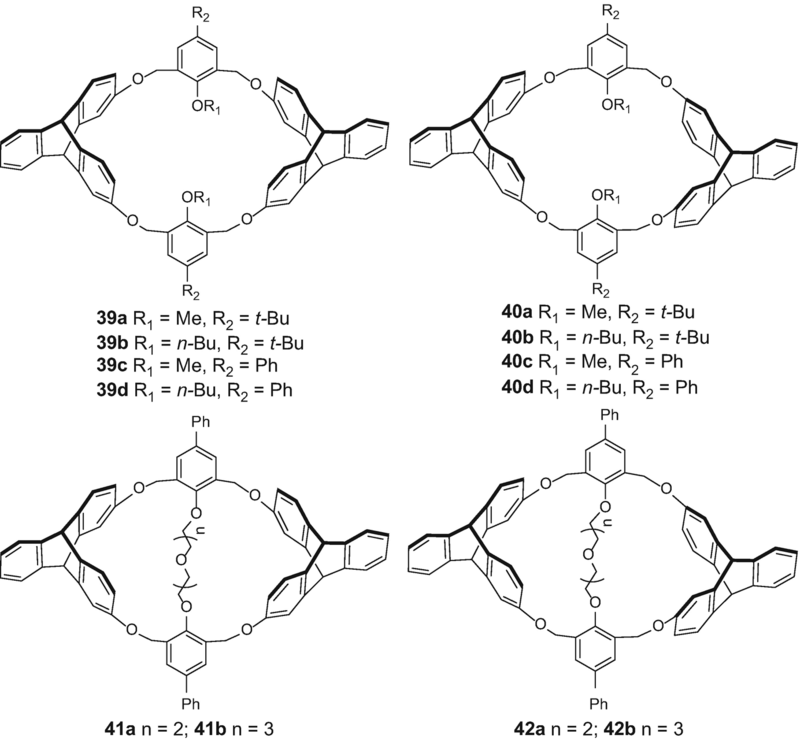 Calixtriptycenearenes have enough large and well-defined electron-rich cavity for fullerenes . 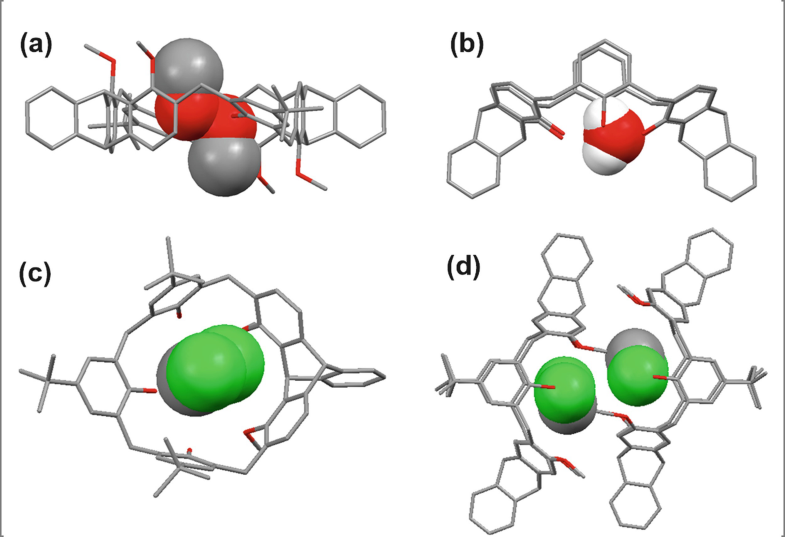 Consequently, 4b and 5b could form 1:1 stable complexes with C60 and C70 with the association constants (Ka) more than 1 × 104 M−1 by the fluorescence titrations, which were significantly higher than those ones (9–1300 M−1) of 1:1 complexes between C60 and the classical calixarene derivatives . 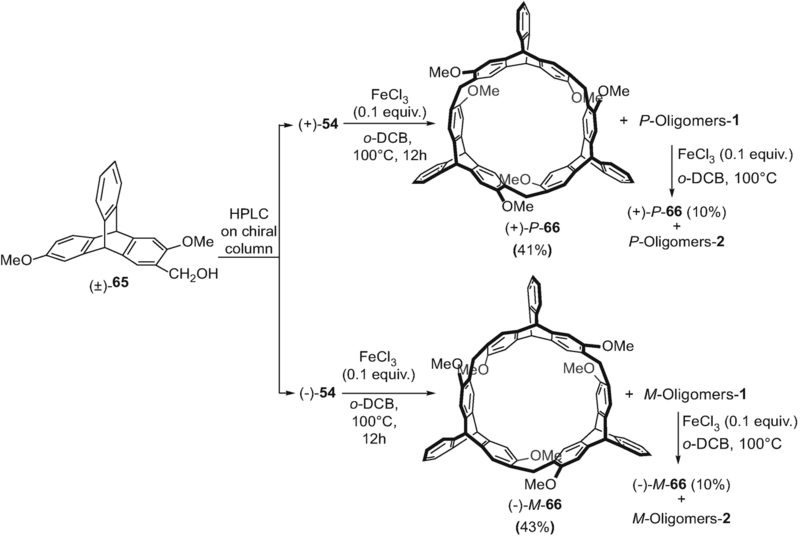 This probably revealed the introduction of the triptycene moiety not only fixed conformations of the macrocycles but also enhanced the interaction of concave cavities of the macrocycles with the electron-deficient convex surface of the fullerenes. 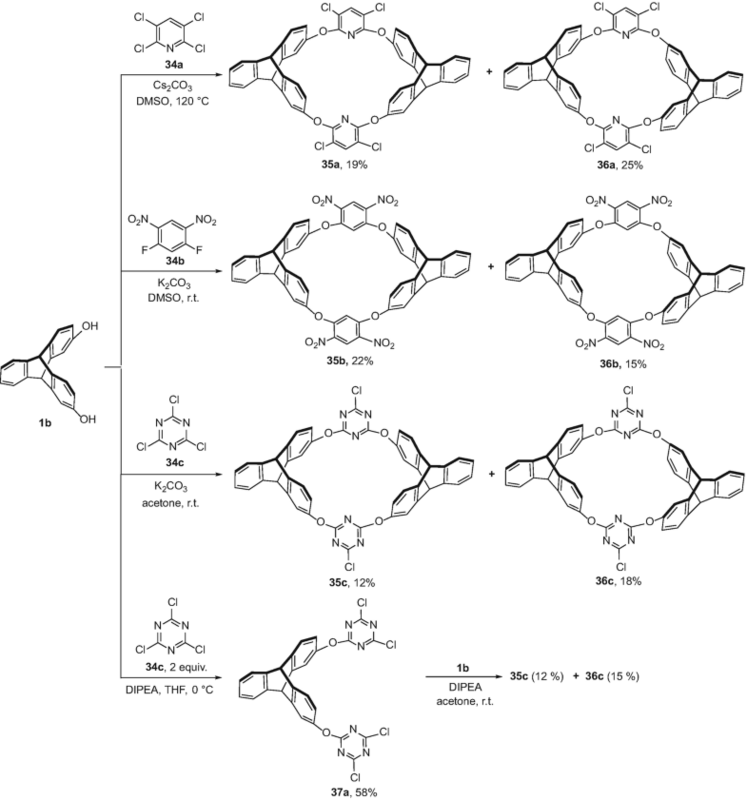 Oxacalixarene 35d with extended cavity could also form 1:1 complexes with C60 and C70, and Ka values for 35d•C60 and 35d•C70 were (7.54 ± 0.29) × 104 and (8.96 ± 0.31) × 104 M−1, respectively . Similarly, homooxacalixarene analogues 39a–d and 40a–d with fixed conformations and large electron-rich cavities showed efficient complexation abilities toward fullerenes C60 and C70 as well , and Ka values for the 1:1 complexes were over 104 M−1. Macrocycle 13 with electron-rich cavities could form 1:1 complexes with paraquat derivatives 53a–d (Fig. 11), and the association constants (Ka) are all over 102 M−1 . It was found that they could show strong complexation capabilities with a series of paraquat derivatives. Oxacalixarenes 35d and 36d with large enough cavities and fixed conformations could also form 1:1 complexes with paraquat derivatives, and the Ka values were about 103 M−1 for 35d and 102 M−1 for 36d . Similarly, 38a showed moderate complexation abilities toward various bipyridinium salts, but affinities of 38b toward the guests were found to be substantially stronger, which might be due to the additional non-covalent interactions between the aniline group and the guests . Formation of the complexes was further evidenced by crystal structures of 35d•53a, 35d•53f, and 38b•53i (Fig. 12). Interestingly, complexation and dissociation of the complex based on 35d containing 1,8-naphthridine subunits could be easily controlled by acid/base stimuli or by the addition and removal of Hg2+ ions . It was further found 35d showed a highly selective fluorescence sensing toward Hg2+ . Moreover, 35d could encapsulate π-extended viologens 54–55 to form pseudorotaxane-type complexes in solution and solid state, and the complexation between the host and the guests could be reversibly switched by acid and base. Nonsymmetric structure of 35d also resulted in orientationally selective pseudorotaxanes depending to different lengths of the linkers in the guests, which might be ascribed to different complexation modes between the components in the complexes . As a class of near-IR fluorescent dyes with specific photophysical properties, squaraines have shown wide potential applications in such as imaging, nonlinear optics, photovoltaics, ion sensing, and so on. However, in polar solvents, they are susceptible to aggregation, which can limit their applications. Thus, the maintenance of the chemical stability and the photophysical properties of the dyes is the key to the development of squaraine applications. The novel triptycene-based tetralactam macrocycles 52a–b have well-defined conformations, so we first tested their complexation with squaraine 56b [31, 35]. Consequently, we found that the macrocycles 52a–b could show highly efficient complexation with the squaraine to form a new kind of stable pseudorotaxane-type complexes in solution and in the solid state. It was noted that the complexation-induced asymmetry of the guest in the complex between 52a and 56b was also observed owing to the cone conformation of 52a. When the free guest 56b and the complexes 52a•56b and 52b•56b were dissolved in THF/water solution (4:1). After 4 days, we found that the guest 56b underwent hydrolytic decomposition to turn colorless, whereas the solution of the complexes retained their blue colors for several weeks. This observation revealed that the formation of complexes could efficiently protect the squaraine dyes from polar solvents. Then we further studied on the complexation of the macrocycles and the squaraine dyes with different terminal groups (Fig. 13) [31, 35], and it was found that squaraine 56a containing smaller terminal groups could thread the wheels 52a–b to form pseudorotaxane complexes. In the case of 56c, it was found that it could penetrate through macrocycle 52b to form a pseudorotaxane-type complex, while there was no similar insertion process between 52a and 56c at room temperature. But rotaxane 52a•56c could be formed through slippage method, when the mixture of 52a and 56c was heated to 333 K for over 6 days. In addition, when host 52a or 52b was mixed with squaraines 56d and 56e and in CDCl3, there were no signals for complexes in 1H NMR spectra even after being heated at 333 K for several days. 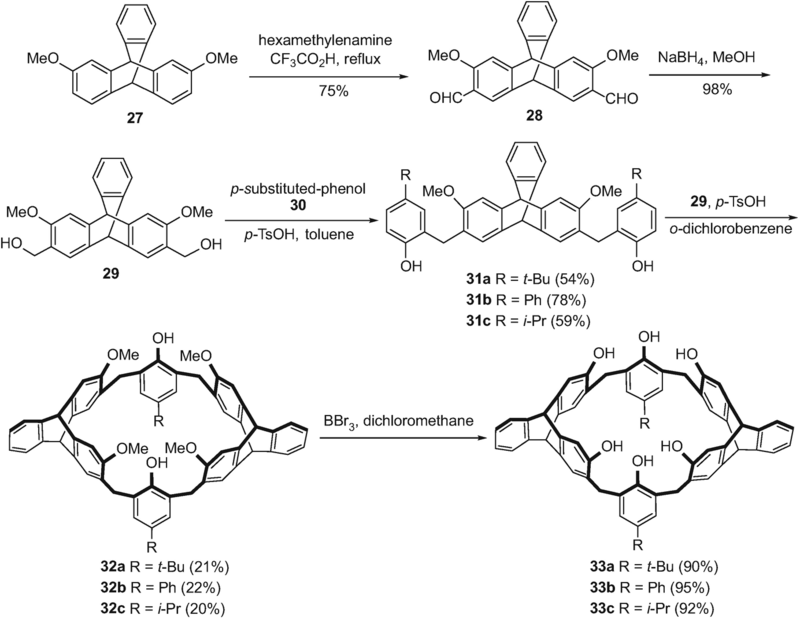 These results revealed that the bulker N,N-bis-n-butyl and N,N-bisbenzyl groups are large enough as the stopper for the rotaxanes with triptycene-derived macrocycles 52a–b through the slippage method. 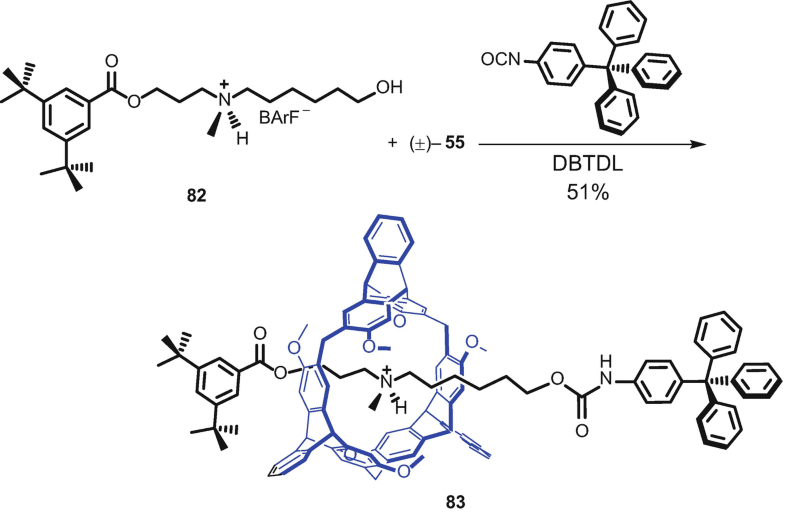 In the case of the squaraine 56 g with two different bulky stoppers could not form pseudorotaxane complexes with hosts as well. However, when host 52a was mixed with guest 56f, two new sets of resonances could be found in the 1H NMR spectrum, and the intensity of one set was higher than the other one. This result suggested that two isomeric pseudorotaxane complexes based on 52a and 56f were obtained, and the complexation showed a slight selectivity. Thus, we chose 56d–g with bulky stopper groups as the templates to synthesize a new type of isomeric rotaxanes via the clipping reactions. Moreover, a series of squaraine-based rotaxanes could thus be obtained by the condensation reactions between pyridine-2,6-dicarbonyl dichloride and 2,7-diaminotriptycene 1c in the presence of an appropriate squaraine derivative. These rotaxane-type complexes showed higher chemical stabilities than those of free squaraines. 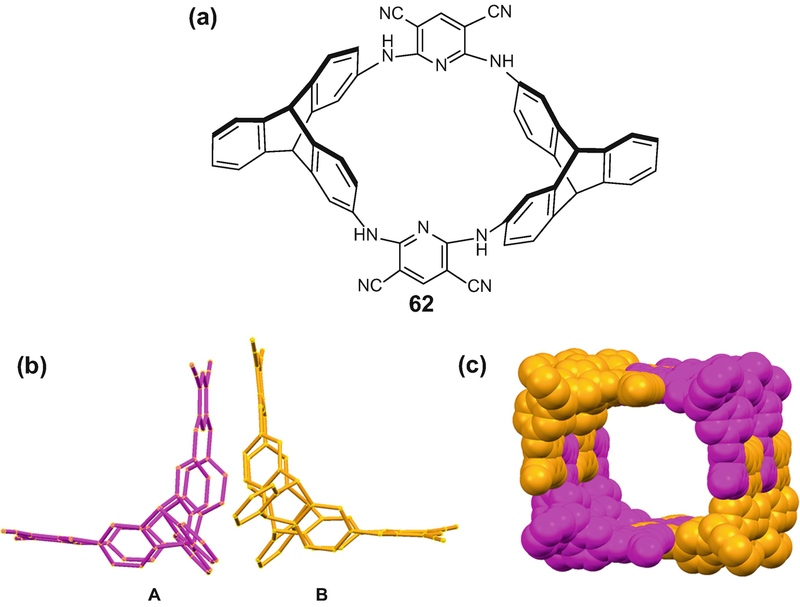 Due to the introduction of rigid triptycene moiety, the novel triptycene-derived macrocyclic hosts showed the fixed conformations, which also makes the macrocycles as the building blocks for the formation of a variety of supramolecular structures via self-assembly. Consequently, it was found that both the cis isomer 4a with cone conformation and the trans isomer 5a with a chair conformation could self-assemble into tubular structures with the aromatic rings as the walls and phenolic oxygen atoms situated in their cavities. Then, these tubular assemblies could further stack into 2D superstructures and 3D microporous architectures with the solvent molecules inside the channels. 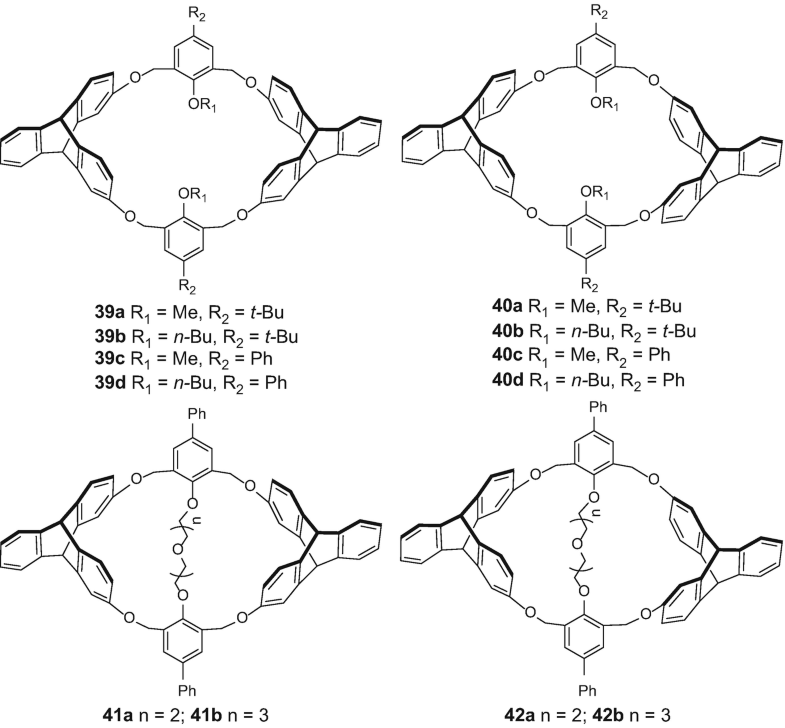 In these supramolecular structures, the multiple non-covalent interactions based on macrocyclic molecules 4a and 5a between the solvent molecules and the macrocyclic molecules played important roles (Fig. 14) . Similar to macrocycle 4a, cis isomeric calixarenes 7a and 7c could also self-assemble into the tubular structures. In the case of the trans isomer 4b, the self-assembled structure was different from those of the cis isomers with cone conformations. It could self-assemble into a 1D supramolecular structure, and further microporous architecture with a pair of C − H···O hydrogen bonding between the aromatic proton of the phenol ring in one macrocycle and the phenolic oxygen of its adjacent macrocycle and the π − π interaction between the phenyl rings of the adjacent triptycene moieties . 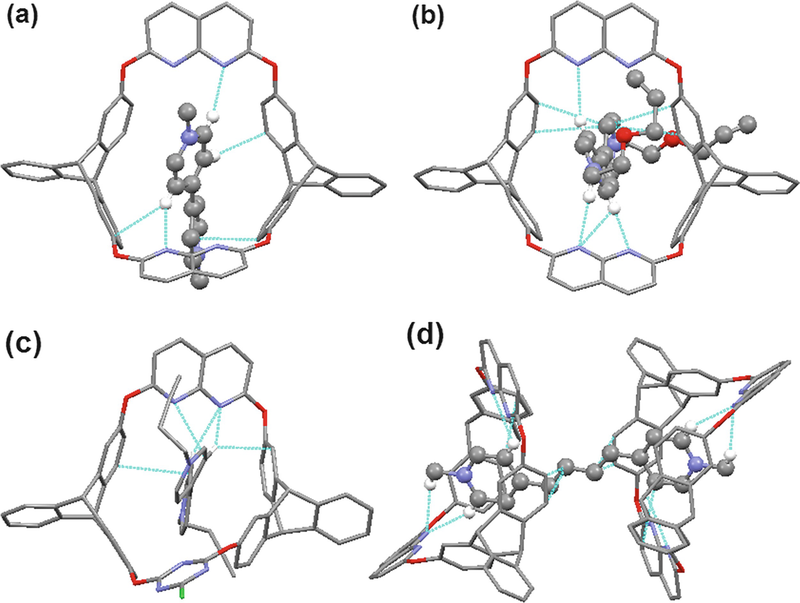 For triptycene-derived calixresorcinarene-like hosts, the cis isomer 32a could form a head-to-head dimeric capsule with two CH2Cl2 molecules inside the dimeric cavity with the C−H···O hydrogen bonding interactions and the C−H···Cl interactions between the macrocycles and solvent molecules . Then, the dimers could form a tubular structure and further assemble into a 3D microporous architecture, and the CH2Cl2 molecules were situated in the channels. Similarly, its demethylated macrocycle could also self-assemble into the 3D microporous architecture via the previous self-assembled head-to-head dimer by the multiple non-covalent interactions between the macrocycle and its adjacent molecules and solvents (Fig. 15). 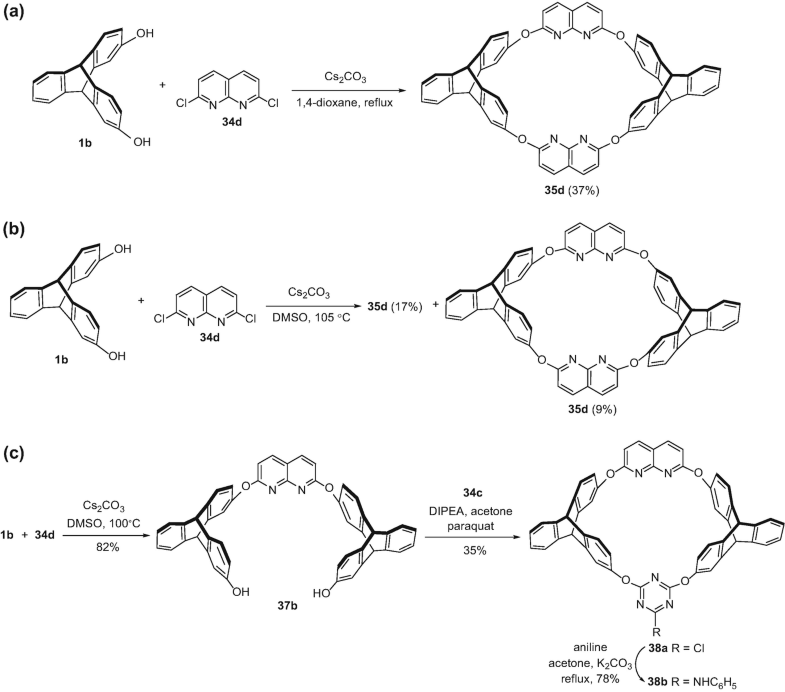 Expanded oxacalixarenes 35a could assemble into an organic tubular structure by virtue of the multiple chlorine bonding including C−Cl···Cl, C−Cl···O, and C−Cl···π interactions, in which the aromatic rings acted as the wall and the nitrogen atoms of the pyridine rings all pointed inward the tube (Fig. 16) . 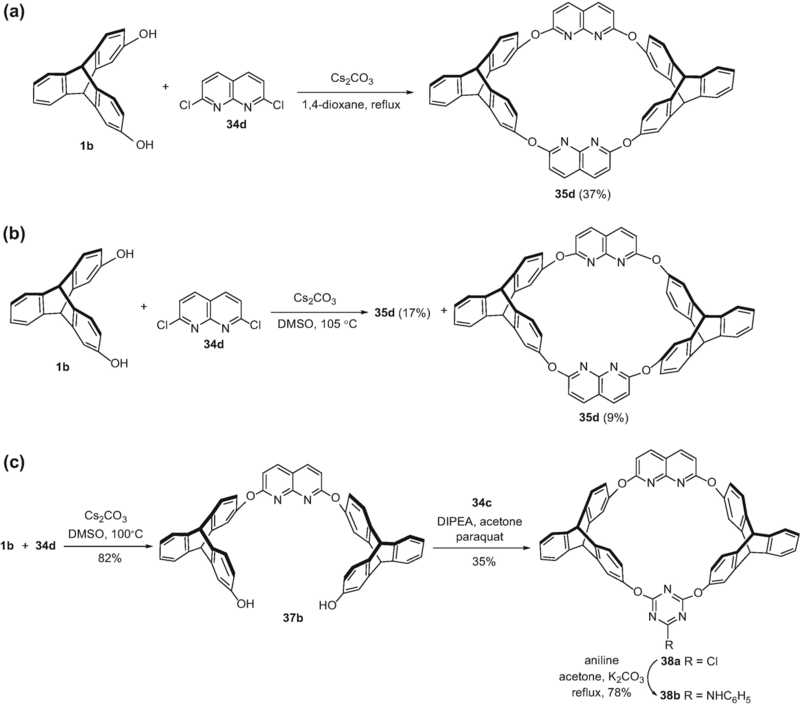 Similarly, with multiple intermolecular chlorine bonding interactions, oxacalixarenes 36a and 35c could also assemble into organic tubular structures and further porous architectures. Based on complexation between 13 and the paraquat derivative, a rotaxane-type assembly was synthesized in 28% yield . 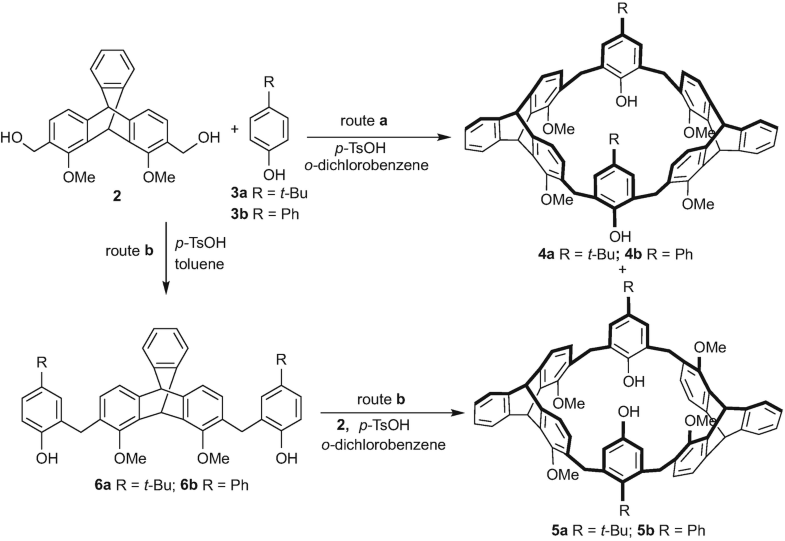 Similarly, we synthesized a pair of isomeric rotaxanes 56a and 56b based on 35d and 36d, respectively, which is the first example of oxacalixarene to be used as useful wheel for the synthesis of mechanically interlocked molecules. Rotaxane 56a was further evidenced by its crystal structure, in which the axle was bent and one stopper group was positioned close to the 1,8-naphthyridine unit of the wheel with scorpion-like mode (Fig. 17) . Oxacalixarene 35d with an upper semi-cavity encircled by two naphthyridine moieties and a lower semi-cavity by two triptycene moieties encouraged us to further investigate the directional complexation between the macrocycle and a nonsymmetric guest. By 1H NMR spectra and crystal structures, it was unequivocally shown the bipyridinium guests 57a–b preferred to thread from the triptycene rim and subsequently gave rotaxanes 58–59a as major products. With 60 as axle, unidirectional threading was achieved to give rotaxane 61 as the sole product. Thus, the threading direction and the orientation could be finely controlled by adjusting the electrostatic and steric effect of the guests (Scheme 12) . Moreover, macrocyclic 40d could also form a tubular assembly with the aromatic rings as the wall and then 3D microporous architecture (Fig. 18) with a pair of intermolecular complementary C−H···π interactions between the aromatic proton of the triptycene moiety of one molecule and the aromatic ring of the triptycene moiety of its adjacent molecule and another C−H···π interactions between the proton of the bridging methylene and the aromatic ring of the p-phenyl moiety of its adjacent molecule . Crystals of 62 (Fig. 19a) suitable for X-ray crystallographic analysis were obtained by slow evaporation of a solution of 62 in THF–CH3OH. Its crystal structure showed that the azacalixarene molecule could self-assemble into a novel aromatic single-walled organic nanotube . It was found that the unit cell contains two molecules of 62 (denoted as A and B, Fig. 19b), in the boat-like conformation with similar cavity in one unit cell. The further study showed that two molecules of A were located in opposite positions and generated a rectangular geometry with the four cyano groups and four NH sites in the same direction, while two molecules of B were also located face-to-face and generated a rectangular geometry rotated with respect to the former one by 90°. 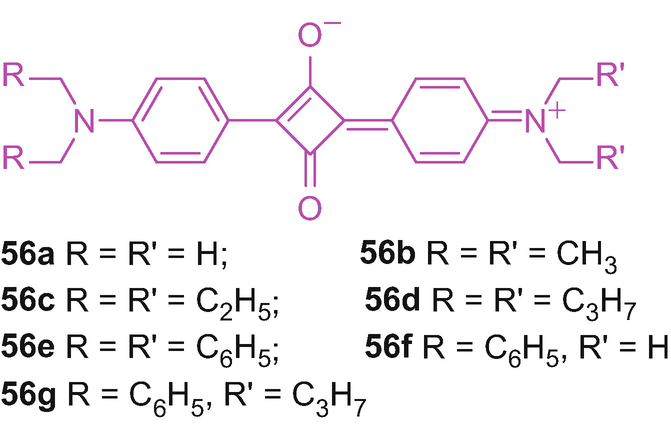 Owing to the two pyridine rings in one molecule of 62, it can contribute totally four pairs of hydrogen bonds and participate in two zigzag H-bond chains with other molecules for self-assembly. With the proper geometrical constraints of the building blocks and the relatively strong non-covalent interactions, a nanometrescale cubical organic nanotube is formed spontaneously (Fig. 19c). This nanotube is generated totally by four one-dimensional H-bond chains, which are parallel or approximately parallel to the axis of tube and lead to the formation of four planes that consist of pyridine rings and their adjacent atoms. The triptycene motifs in 62 linking these planes are located in the square corner. In addition, the rotaxane based on triptycene-derived tetralactam macrocycle could also self-assemble into a tubular structure in the solid state via the typical hydrogen bonds between the amide protons of the hosts and the carbonyl oxygen atoms of the guests, and the multiple π–π stacking interaction and C−H•••π interactions between triptycene subunits and the aromatic rings of the guests, along with the squaraine dyes inside of the channels. However, the similar honeycombed superstructures could not be found in the free macrocycles; it suggested that the non-covalent interactions between the host and the guest as well as the solvent interactions played important roles in the arrangement of extended channels. 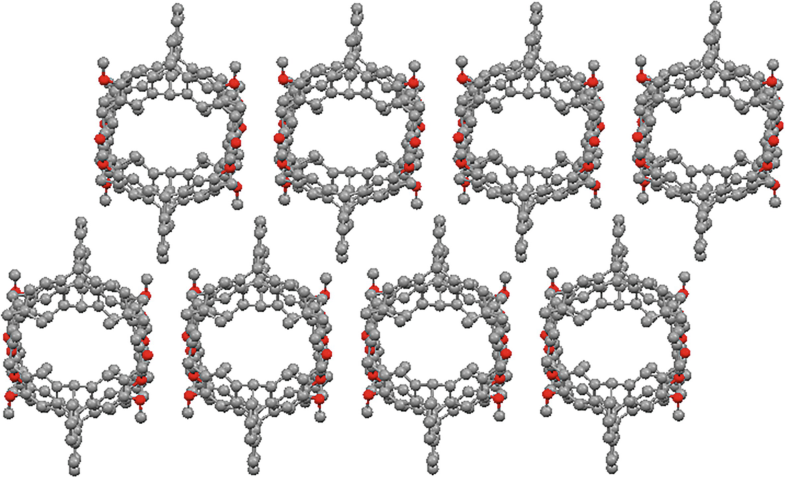 Moreover, it was further found that the rotaxane with nonsymmetrical macrocycles could self-assemble into an oriented nonsymmetrical channel-like structure (Fig. 20) . 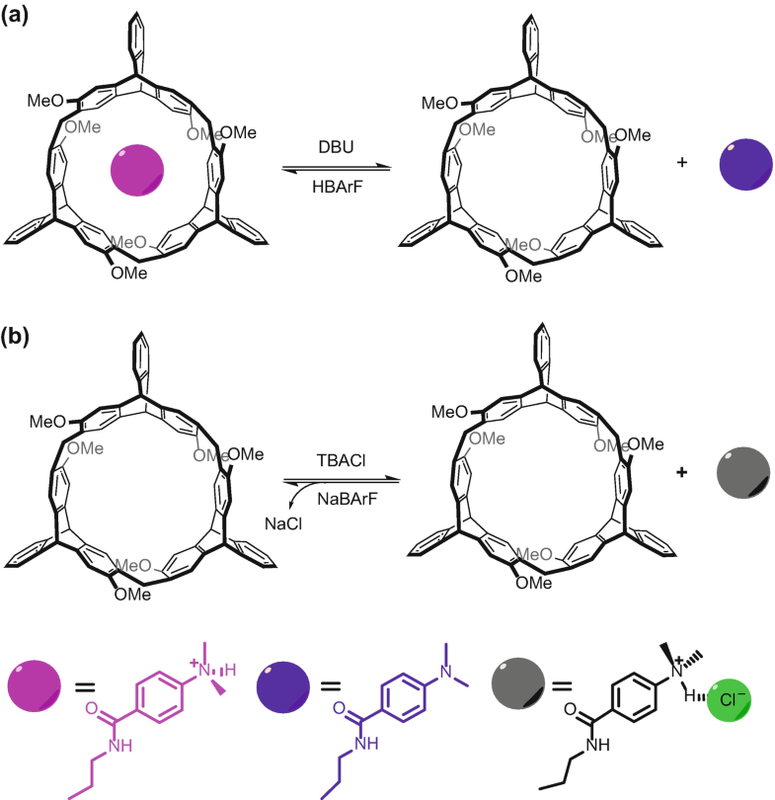 During the past decades, chiral synthetic hosts based on the macrocyclic arenes have attracted much attention for their wide applications in chiral recognition and self-assembly. Generally, chiral macrocyclic arenes could be obtained by introducing chiral auxiliary into the macrocyclic skeleton . Introducing inherent chirality is another strategy to build chiral macrocyclic arenes [39, 40], but their fussy synthesis and the difficulty in utilizing the macrocyclic cavities limit their practical applications to some extent. Recently, Ogoshi and coworkers  reported a new type of planar chiral macrocyclic arenes based on pillararenes. 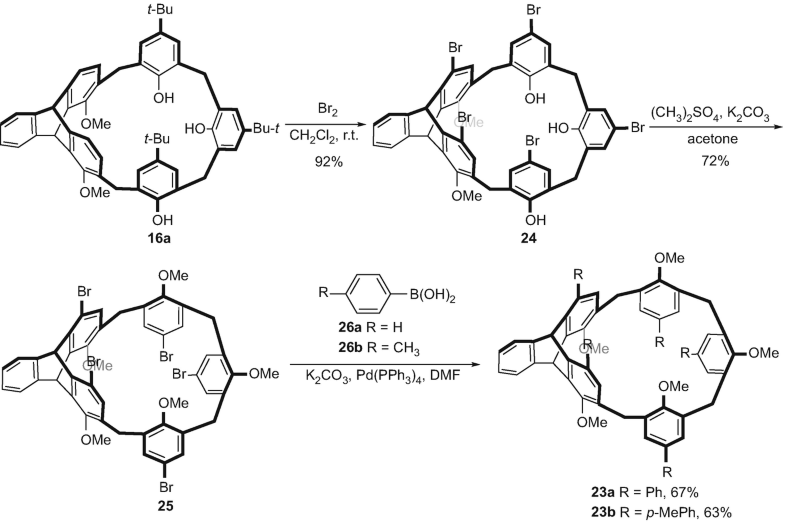 Undoubtedly, chiral building blocks can provide an efficient and direct way to construct chiral macrocyclic arenes, but no such examples have been reported before. It was known 2,6-dihydroxy substituted triptycene is an easily available chiral compound. Based on this chiral triptycene building block, a new class of chiral macrocyclic arene composed of 2,6-dihydroxyltriptycene subunits bridged by methylene groups could be obtained. Since the macrocycle adopts a hex nut-like structure with a helical chiral cavity, we can name them as helicarenes . Starting from commercially available 2,6-dimethoxyanthracene, we first prepared triptycene derivative (±)-65 on a gram scale by Diels–Alder cycloaddition, aldehyde reaction, and reduction reaction. Then, treatment of (±)-65 in tetrachloroethane with a catalytic amount of p-toluenesulfonic acid gave macrocycle (±)-66 in 15% isolated yield. Finally, the demethylation of (±)-66 by BBr3 in dichloromethane produced the target macrocycle (±)-65 in 98% yield, which showed good solubility in polar solvents including acetone, acetonitrile, and methanol. Efficient resolution of (±)-67 was performed by introducing the chiral auxiliary, separation with common column chromatography, and then hydrolysis to give enantiopure (+)-67 and (−)-67 (Scheme 13), which were evidenced by their CD spectra with mirror images. Recently, we  also performed the chiral resolution of (±)-65 by HPLC on chiral column, and with (+)-65 and (−)-65 as the precursors, we could conveniently obtain enantiomers (+)-66 and (−)-66, respectively, in gram scales (Scheme 14). Aryl bromides were very useful precursors for organic synthesis, and they could be easily obtained by bromination of aromatic compound. Hence, we tested the bromination of (±)-66 with Br2 gave (±)-69 in 88% yield, which was demethylated by BBr3 in dichloromethane to give hexabromo-substituted helixarene derivative (±)-70 in 95% yield. By Suzuki coupling reactions of (±)-70 with aryl boronic acids gave a series of helixarene derivatives (±)-71a-f in 55–71% yields. Similarly, starting from (+)-66 and (−)-66, (+)-70 and (−)-70 could be conveniently synthesized and obtained enantiomers (+)-71a-f and (−)-71a-f in good yields through Suzuki coupling reactions (Scheme 15) . For macrocycle (±)-67, the six benzene rings belonging to the three triptycene moieties form a large hexagonal prism. The bond vector of the triptycene rim viewed from the top down the C3 axis of the macrocycle, that is to say macrocycle (±)-67 has a C3 symmetrical structure. Its variable-temperature 1H NMR spectra showed no obvious methylene proton signal changes between −40 and 120 °C, indicating the macrocycle adopted a fixed conformation in solution over the wide temperature range tested and thus is obviously different from the behavior of the classical calixarenes and pillararenes. The crystal structure of (±)-67 (Fig. 21) showed the bond angles between the adjacent triptycene units were 112–114°, which were close to the tetrahedral bond angle of 109°. The distances between the two centers of opposite aromatic faces in (±)-67 (Fig. 21) were showed 9.0–9.2 Å of the distances between the two centers of the opposite aromatic rings, which is similar to, or larger than those in pillararene, β-cyclodextrin, and cucurbituril. Moreover, the deepened cavity of 5.28 Å in (±)-67 was found, and it was also far larger than the longitudinal thickness of triptycene (2.66 Å) . The direction of the triptycene rim was defined by using Cahn–Ingold–Prelog priority rules, which involve moving from the hydroxy-substituted carbon atom with greater priority on the phenylene ring toward the methylene-substituted carbon atom with lower priority. Correspondingly, we first defined the stereochemistry of enantiomers (+)-67 and (−)-67 as P and M configuration, respectively. Then, from the crystal structure of diastereomer 68a (Fig. 22a), the absolute configuration of its macrocyclic skeleton could be easily determined to be in a P configuration . Moreover, we also obtained the crystal structure of (+)-P-70 (Fig. 22b), which further confirmed the absolute configuration of the enantiomeric helicarenes . Since (+)-67 and (−)-67 contain electron-rich cavities and six hydroxyl groups, we deduced they could efficiently and enantioselectively complex with chiral organic ammonium salts by multiple non-covalent interactions including cation-π interaction. So, we tested the complexation between the chiral hosts and three pairs of chiral guests 72–74 (Fig. 23) and found, even without any modification, the chiral macrocycles showed obvious enantioselective recognition toward these chiral guests. Especially, for guest 72, methylated derivative of 1-indamine, the enantioselectivity was considerably high . So after, we found (±)-66 could form 1:1 complexes with acetyl choline 75a and thiaacetyl choline 75b in solution and solid state. Compared with (±)-66, (±)-67 with no modification showed stronger binding abilities toward the two guests probably due to the additional multiple non-covalent interactions between the hydroxyl groups of (±)-56 with the guests. Therefore, we then tested the complexation between (±)-67 and different kinds of quaternary ammonium salts 75c–m (Fig. 24) and found (±)-67 showed significant complexation toward these wide tested guests. Moreover, (±)-66 and (±)-67 could also form 1:1 complexes with different kinds of N-heterocyclic salts 43i, 76a–d, and even TCNQ (77) in solution and solid state (Fig. 25) . (±)-66 and (±)-67 could form 1:1 complexes with tropylium 78 in solution as well. Color change of the solution and formation of the CT band in UV-vis spectra indicated the charge-transfer interactions in the complexes. Especially, the binding and release of the guest in the complexes could be efficiently controlled by redox stimulus (Fig. 26), and this responsive process could be visually observed by color change of the solution. For the complex based on (±)-66, the redox-responsive cycles could be repeated at least 10 times. For the complex from (±)-67, similar phenomenon was also found, and the redox-responsive cycles could be repeated at least five times . We  proved (±)-66 could form 1:1 complexes with protonated tertiary ammonium salts 79a–h and also found the small steric hindrance of the substituent groups on the N atoms or the para-substituted electron-withdrawing group on the aromatic ring of the guests could be beneficial for the complexation. The switchable complexation between the macrocycle and the guests could be efficiently controlled not only by acid and base stimuli (Fig. 27a) but also by the addition and removal of chloride ion (Fig. 27b). Moreover, based on the host-guest complexation, we further synthesized the first helicarene-based rotaxane 83 (Scheme 16). (±)-66 could also form 1:1 complexes with protonated pyridinium salts 80a–c , and the binding and release of the guests in the complexes could be efficiently controlled not only by acid and base (Fig. 28a) but also by light stimuli in the presence of photoacid 1-MEM (Fig. 28b). Furthermore, we designed and synthesized three pairs of chiral rotaxanes 84–85  and found the shuttle, oscillation, and palindromic motion of (±)-66 between the protonated pyridium site and the alkyl group site could be efficiently controlled by sunlight in the presence of 1-MEM through photo-induced proton transfer (PIPT) strategy (Fig. 29), which also provides the systems with excellent repeatability more than 50 cycles. This represents the first successful example of PIPT strategy in molecular machines based on mechanically interlocked molecules . More recently, we  also conveniently synthesized a water-soluble 2,6-helicarene derivative containing six carboxylato groups (87) and found the host could form 1:1 stable complexes with quaternary phosphonium salts 81a–c in water. According to the isothermal titration calorimetric experiments, the association constants for the 1:1 complexes between 87 and guests 81a–c were determined to be over 105 M−1, indicating the host showed strong binding abilities toward the tested quaternary phosphonium salts in aqueous solution. Moreover, the binding and release of the guest in the complexes could be efficiently controlled by acid/base stimulus (Fig. 30). 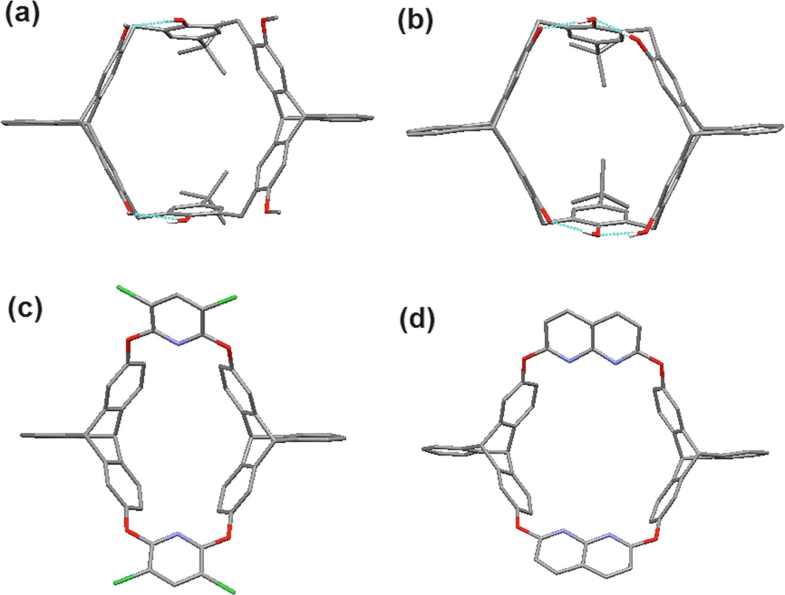 In summary, it has been proved that triptycene derivatives with unique three-dimensional structure could be utilized as useful building blocks for the design and construction of new kinds of macrocyclic arenes and their analogues. Consequently, a series of triptycene-derived calixarenes, heteracalixarenes, tetralactam macrocycles, and their analogues were conveniently synthesized with satisfactory yields by one-pot method or two-step fragment-coupling reactions. 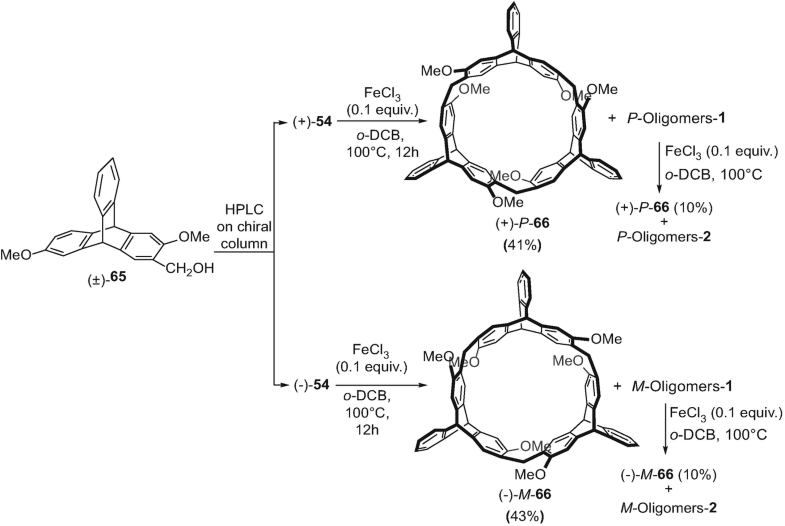 Moreover, these triptycene-derived macrocyclic hosts had large enough cavities and showed fixed conformation in solution. These structural features made them exhibit not only well molecular recognition toward small organic molecules, fullerenes, and organic dyes but also wide potential applications in molecular recognition and self-assembly. Especially, we developed a new kind of chiral macrocyclic arenes named as helicarenes based on chiral 2,6-dihydroxyl-substituted triptycene subunits bridged by methylene groups. It was found that the helicarenes exhibited convenient synthesis, high stability, good solubility, fixed conformation, easy functionalization, and wide complexation with different kinds of chiral and achiral organic guests. Especially, the switchable complexation based on these macrocycles could be efficiently controlled by multi-stimuli including acid-base, redox, anion, or light stimulus in the presence of photoacid. However, the researches on these triptycene-derived macrocyclic hosts, especially helicarenes, are still in the infancy. Expanding new members of helicarene family and development of their potential applications are an urgent work in supramolecular chemistry. 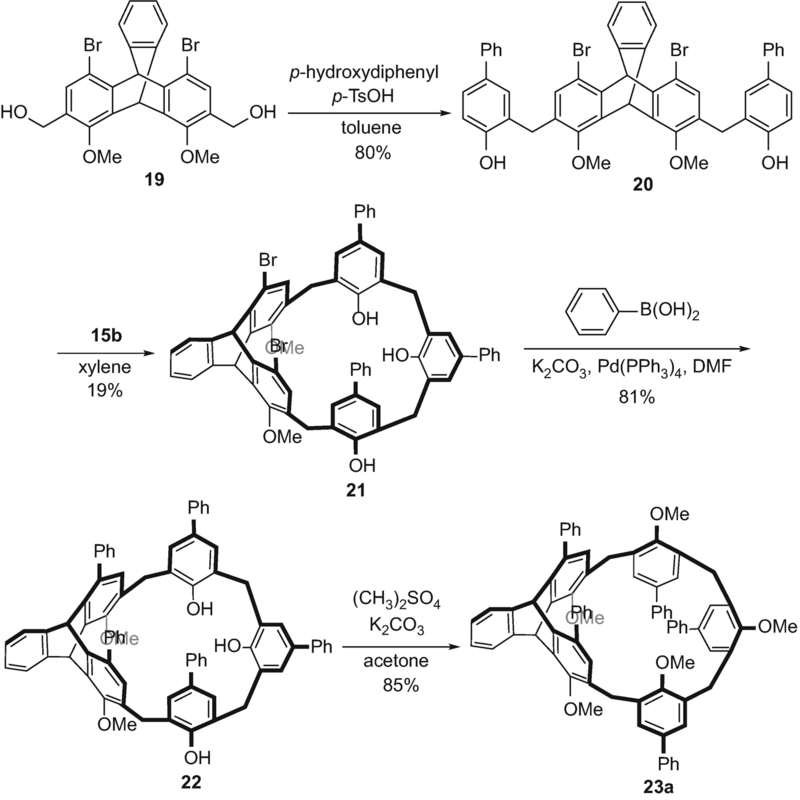 But we believe that the triptycene-derived macrocyclic arenes, especially helicarenes with special structural features and varied complexation behaviors, could become a new kind of synthetic hosts and thus attract more and more attention in macrocyclic and also supramolecular chemistry in the near future.